Background: Ophiopogon japonicus is a medicinal and edible plant widely used in China. Despite a long history of O. japonicus tea (OJT) in health promotion, however, the mechanistic studies on its actions are lacking. Objective: This study aims to evaluate the antioxidant activity and longevity-promoting potential of OJT using Caenorhabditis elegans model. Materials and Methods: The antioxidant capacities of OJT were first determined by 2,2-diphenyl-1-picrylhydrazyl (DPPH) scavenging and paraquat survival assay, respectively, and then, further investigated by determining the reactive oxygen species (ROS) level, malondialdehyde (MDA) content, and superoxide dismutase (SOD) activity. The lifespan assay and lipofuscin accumulation assay were performed in a similar fashion to the paraquat survival assay but without paraquat exposure. Results: We first show by DPPH scavenging assay that OJT can scavenge free radicals. We then reveal that OJT can not only increase the survival rate of the nematodes but also reduce the endogenous levels of ROS under oxidative stress induced by paraquat. We also show that OJT is capable of increasing the activities of SOD and CAT and reducing the content of MDA in paraquat-exposed C. elegans. Further studies indicate that OJT is able not only to extend the lifespan of the nematodes but also to improve the age-related decline of pharyngeal pumping and reduce accumulation of the age pigment lipofuscin in the animals. Conclusion: Our data demonstrate the antioxidant activity and age-delaying effect of OJT and thus provide an important insight into the potentials of O. japonicus for health promotion. Abbreviations used: CAT: Catalase; MDA: Malondialdehyde; OD: Optical density; OJT: Ophiopogon japonicus tea; ROS: Reactive oxygen species; SOD: Superoxide dismutase. Conventionally, O. japonicus is used in herbal prescriptions, for example, Sheng Mai San, a well-known Chinese prescription comprised Panax ginseng, Schisandra chinensis, and O. japonicus, has a long clinical history in the treatment of heart failure and ischemic heart diseases., Recently, there is an increasing interest in O. japonicus as a source for biologically active compounds. Crude extracts and fractions, as well as isolated constituents such as polysaccharides, saponins and flavonoids, of O. japonicus are known to have antioxidant, antithrombotic, anti-inflammatory, and other activities.,, For example, the polysaccharide fractions from O. japonicus tuber are shown to have strong in vitro free radical-scavenging and macrophage-activating capacities, indicating the antioxidant and immunomodulatory potentials of O. japonicus. Interestingly, a steroidal saponin isolated from O. japonicus can extend the replicative lifespan and increase the oxidative survival of yeast, suggesting an anti-aging activity of O. japonicus. In addition to medical applications, O. japonicus is also widely used in general diet. For example, O. japonicus has been used to make herbal tea by simply infusing in hot water, which is purportedly invented by Sun Simiao (581-682), a well-known Chinese doctor and herbalist in the Sui and Tang dynasty. According to the folklore, O. japonicus tea (OJT) is useful in increasing energy, improving overall health and promoting longevity. Despite a long history of OJT in health promotion, however, there are very few mechanistic studies on its actions. As a herbal tea, OJT is in essence a non-concentrated decoction, i.e., an aqueous extract containing a mixture of saccharides, amino acids, polyphenols, and other high-polar ingredients. Given that many orally taken decoctions can modulate oxidative stress,, the primary aim of this study is, therefore, to evaluate the antioxidant activity and longevity-promoting potential of OJT. We first determined the scavenging effect of OJT on free radicals using in vitro chemical assays, and then investigated its antioxidant and anti-aging activities in Caenorhabditis elegans, a simple yet powerful nematode model widely used in aging studies. Both C. elegans (wild-type N2) and Escherichia coli (OP50 and NA22) strains were obtained from the Caenorhabditis Genetics Center (University of Minnesota, USA). All experiments were performed at 20°C unless otherwise stated. The fresh tuberous roots of O. japonicus were collected from Quanzhou, Fujian, China, and identified by Professor Yan Wang (School of Traditional Chinese Medicine, Guangdong Pharmaceutical University). A voucher specimen (No. 01-MD-2015YS) has been deposited at the Center for Bioresources and Drug Discovery, Guangdong Pharmaceutical University. To make the herbal tea, the tuberous roots of O. japonicus were extracted twice with deionized water at 100°C. First, 100 g of the tuber powder was infused with 1 L of deionized water for 30 min in a shaking bath equipped with temperature control, and the extract was filtered through cotton wool. Then, a second infusion was prepared by adding 0.5 L of boiling deionized water for 30 min followed by filtering through cotton wool. The two infusions were combined and freeze-dried as OJT powder, which was stored at-20°C until use. The powder was dissolved in deionized water to the indicated concentrations before use. Where A0 and A1 are the absorbances of the control and the sample, respectively. Food clearance assay was conducted essentially as described. E. coli OP50 was grown overnight and resuspended at an optical density (OD) of 0.85 in the nematode S medium. OJT was diluted with the E. coli suspension to the indicated concentrations, and 100 μL of the final mixture was added per well into 96-well plates. Approximately 50–80 synchronized L1 nematodes were subsequently added and incubated at 20°C. The absorbance of the culture was determined at 570 nm every day for 5 days. The oxidative survival assay was performed as described previously using paraquat (Sigma, St. Louis, USA). Synchronized L1 larvae were incubated for 42 h and then 75 μg/mL of 5-fluoro-2′-deoxyuridine (FUdR, Sigma) was added. After further incubation for 24 h, the young adult nematodes were transferred to 96-well plates (20 nematodes per well; >100 nematodes for each treatment) containing E. coli NA22 (OD570 nm= 0.5) and 0–8.0 mg/mL of OJT samples. After incubation for another 24 h, the nematodes were exposed to 50 mM paraquat. The numbers of live and dead nematodes were scored microscopically every 12 h based on their movement and shape. To assess reactive oxygen species (ROS) levels under oxidative stress, synchronized young adult nematodes were incubated with or without OJT samples for 24 h and then treated with 2 mM paraquat for 2 days. The determination of ROS levels was performed as described previously. Briefly, bacteria were removed by three repeated washes with M9 buffer and subsequent centrifugation at low speed. The nematodes were collected and dispensed into black 96-well plates (100 animals per well; 800 animals for each treatment) by a COPAS Biosort instrument (Union Biometrica, Inc., Holliston, MA, USA), and then, the fluorescent probe 2',7'-dichlorofluorescin diacetate (DCFH-DA; Sigma) was added at 50 μM final concentration. The plates were incubated at 20°C for 1 h, and the ROS-related DCF fluorescence was measured by the Fluoroskan Ascent FL plate reader at excitation 485 nm and emission 520 nm. Activity of antioxidant enzymes and content of malondialdehyde (MDA) were determined as previously described. Briefly, synchronized young adult nematodes were incubated with or without OJT samples for 24 h and then treated with 2 mM paraquat for 2 days. Approximately 4000 nematodes were then collected and washed three times with M9 buffer, transferred into an Eppendorf tube, and suspended in 600 μL of lysis buffer from the assay kits. The samples were sonicated in an ice bath, and the supernatant was collected by centrifugation (12,000 ×g, 5 min, 4°C) for the measurement of superoxide dismutase (SOD) activity, catalase (CAT) activity, and MDA content using commercial chemical assay kits (Beyotime, Haimen, China), respectively. The lifespan assay of nematodes was performed in a similar fashion to the paraquat survival assay but without paraquat exposure. The live and dead nematodes were scored every 2 days until all the nematodes died. Age-synchronized young adult nematodes were incubated on NGM agar plates with or without OJT for 4 days and then transferred individually to fresh plates with a lawn of OP50 bacteria. The contractions of pharynx for each nematode were counted manually for 30 s under a dissecting microscope. The pumping rates were measured with 10 nematodes for each group and repeated three times. The accumulation of lipofuscin was assessed essentially as described previously for age pigments. Briefly, day-10 adult nematodes with or without OJT treatment from young adult stage were dispensed to black 96-well plates at 100 nematodes/well by the COPAS Biosort instrument, and the fluorescence of lipofuscin was determined by a Fluoroskan Ascent FL microplate reader (Thermo, Waltham, MA, USA) with 355 nm excitation and 460 nm emission. The statistical analysis was performed primarily by GraphPad Prism 6.0 for Windows (GraphPad Software, San Diego, CA, USA). Statistical significance was determined by one-way analysis of variance. C. elegans survival and lifespan data were analyzed by Kaplan-Meier method and Peto's log-rank test using SPSS 19.0 for Windows (SPSS, Chicago, IL, USA). P < 0.05 was considered to be statistically significant. All experiments were performed at least three times. Free radicals are known to attack biological macromolecules, including DNA, lipids and proteins, leading to oxidative damage and cellular senescence., To examine the antioxidant property of OJT, therefore, we initially tested its ability to scavenge-free radicals using the in vitro DPPH radical scavenging methods, which has been extensively used to assess antioxidant activity. As shown in [Figure 1], the DPPH scavenging activity of OJT was increased when its concentration was increased from 1.0 to 16.0 mg/mL, and then, became stable at ~60%. 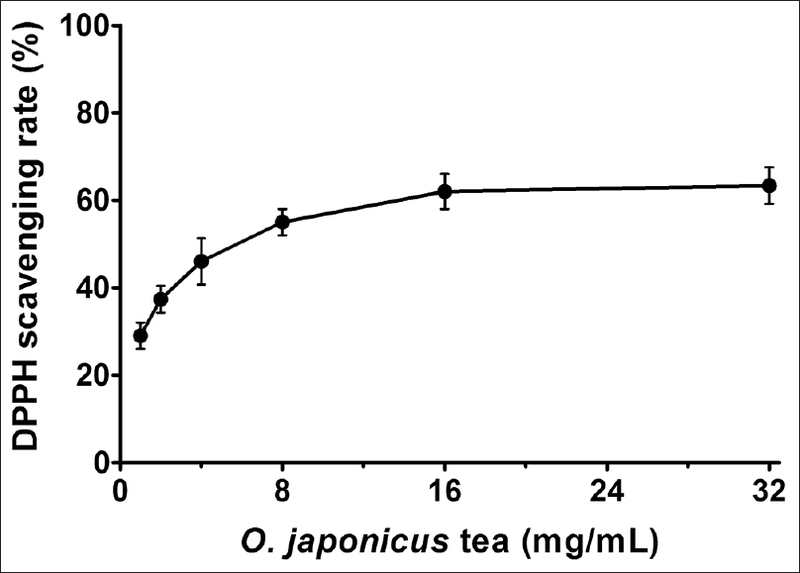 These results demonstrate the in vitro antioxidant activity of O. japonicus tea. Although DPPH radical scavenging assay is widely used to study in vitro antioxidant properties, it does not necessarily predict in vivo antioxidant activity. Therefore, we attempted to evaluate the in vivo antioxidant capacity of OJT using C. elegans models. To do so, we first determined the appropriate concentrations to be used in the nematodes by food clearance assay. The nematodes were grown in liquid culture and treated with 0–16.0 mg/mL of OJT, and the consumption rate of bacteria was monitored by absorbance on a daily basis. 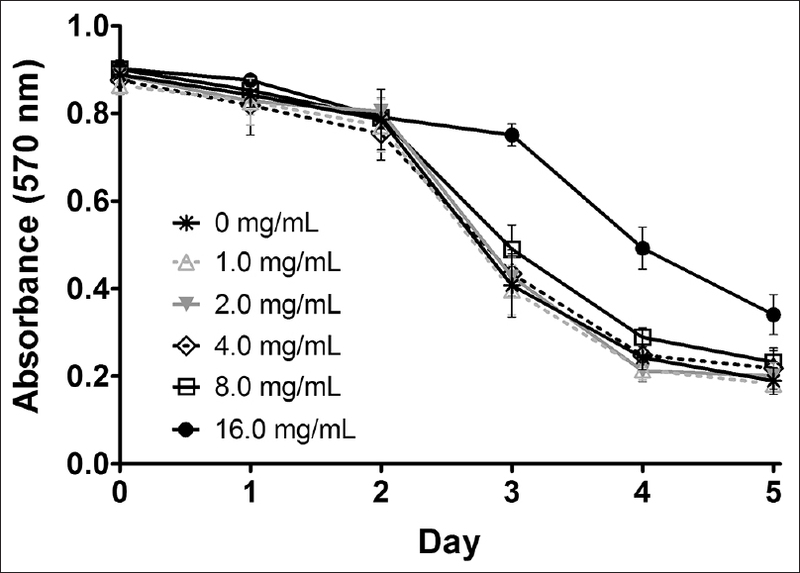 As shown in [Figure 2], the absorbance of the control, as well as that of the nematodes treated with ≤8.0 mg/mL of OJT, was significantly reduced within 5 days, indicating that treatment with up to 8.0 mg/mL of OJT did not affect the nematodes. However, the animals treated with 16.0 mg/mL of OJT displayed an apparent delay in food consumption, suggesting that the herbal tea may have side effect on the nematodes at >16.0 mg/mL. Therefore, in the following experiments, 1.0–8.0 mg/mL of OJT was used as indicated. Survival of animals under increased oxidative stress is undoubtedly a direct index of their antioxidant competence. Therefore, we determined the effect of OJT on the survival rate of C. elegans exposed to paraquat, a strong redox agent that is known to increase intracellular superoxide anion levels and may result in generation of additional toxic hydrogen peroxide and hydroxyl radicals. The nematodes were pretreated with 0–8.0 mg/mL of OJT for 24 h and then exposed to 50 mM paraquat, and the live and dead nematodes were scored every 12 h. As shown in [Figure 3]a and [Table 1], the survival rates of the nematodes pretreated with 1.0–8.0 mg/mL of OJT were all increased as compared to that of the control nematodes exposed to paraquat only; in particular, the mean survival time of the nematodes treated with 8.0 mg/mL of OJT was increased >40%. These results demonstrate the in vivo antioxidant activity of the herbal tea. ROS is a major source of oxidative stress and one of the key factors causing senescence, and compounds with ROS-eliminating ability can protect organisms from oxidative damage. For example, a polyphenol-enriched extract from cocoa seeds is shown to reduce the amount of cellular ROS and related toxicity caused by ochratoxin A, a mycotoxin. Therefore, we further examined the effect of OJT on ROS levels in the nematodes exposed to paraquat. The nematodes were first treated with OJT at the indicated concentrations for 24 h and then exposed to 2 mM paraquat for 2 days, and the ROS level was assessed using the DCFH-DA fluorescence assay. As shown in [Figure 3]b, the relative DCF fluorescence intensity of the nematodes treated with 4.0 and 8.0 mg/mL of OJT was significantly lower than that of the paraquat-exposed control nematodes (P < 0.01), indicating reduced ROS levels after OJT treatment. Taken together, our results demonstrate that the free radical-scavenging and ROS level-reducing activities of OJT may significantly contribute to its antioxidant capability against paraquat toxicity. It is well established that intracellular ROS level is balanced by a set of antioxidant enzymes such as SOD and CAT, which are an important part of the antioxidant system. These enzymes not only scavenge free radicals but also maintain the cellular homeostasis in a living system. However, the endogenous antioxidant system is not always effective to scavenge excessive ROS, leading to interruption of cellular homeostasis and acceleration of aging process. Accordingly, supplementation of exogenous antioxidants is commonly regarded as a promising strategy to promote health and retard aging., To assess the effect of OJT on the endogenous antioxidant defense system, we examined the activities of the antioxidant enzymes SOD and CAT and the content of the lipid peroxidation product MDA in C. elegans. After pretreatment with OJT at the indicated concentrations for 24 h and then exposure to 2 mM paraquat for 2 days, the SOD and CAT activities were increased while the MDA content was decreased in the nematodes treated with 1.0–8.0 mg/mL of OJT as compared to those of the control nematodes exposed to paraquat alone, respectively [Figure 4]. Together, our results suggest that the upregulation of antioxidant enzyme activities by the herbal tea may, at least in part, be responsible for the reduction of ROS levels. A considerable correlation is known to exist between longevity and enhanced tolerance to stress including oxidative, heat shock, and ultraviolet stresses. As shown above, O. japonicus tea is capable of enhancing tolerance of C. elegans to oxidative stress and thus may have the potential to delay aging process. Therefore, we determined the effect of OJT on lifespan, which is unequivocally the most direct antiaging index, using nematode models. As shown in [Figure 5]a and [Table 2], the lifespan of the nematodes treated with 4.0 and 8.0 mg/mL of OJT was indeed extended as compared to that of the control nematodes, demonstrating the age-delaying effect of the herbal tea. In addition to lifespan itself, other age-associated changes in C. elegans include pharyngeal pumping rate and intestinal lipofuscin level, both of which are important physiological parameters to measure the health condition of nematodes., As aging progresses, pharyngeal pumping rate decreases and intestinal lipofuscin content increases., Therefore, we examined the effect of OJT on these physiological functions. The nematodes were treated with 1.0–8.0 mg/mL of OJT and the pumping rate was determined on day 4. As shown in [Figure 5]b, the pharyngeal pumping rate of nematodes treated with OJT was slightly increased, indicating that the herbal tea was able to prevent the age-related decline of pharyngeal pumping and that its lifespan-extension effect was not due to reduced food intake, which is a potential cause of lifespan extension through dietary restriction. Intestinal lipofuscin, a marker for cellular damage during aging, is composed primarily of lipid peroxidation products and oxidized proteins that resist proteolytic degradation. Recent studies suggest that antioxidant treatment can retard age-associated accumulation of lipofuscin., Therefore, we tested whether O. japonicus tea had an effect on the lipofuscin content in C. elegans. The nematodes were treated with 1.0–8.0 mg/mL of OJT and the relative content of lipofuscin was determined based on its fluorescence intensity. 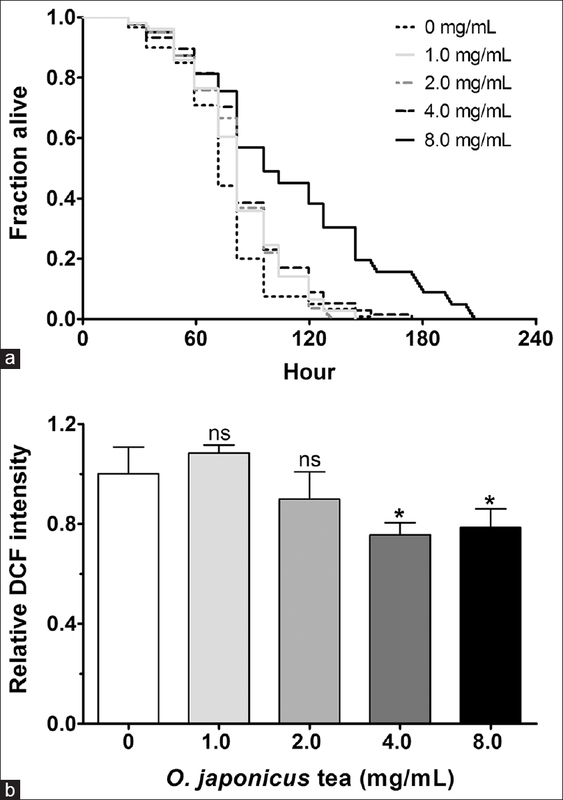 As shown in [Figure 5]c, the relative fluorescence of Day-10 nematodes after treatment from the young adult stage with 4.0 and 8.0 mg/mL of OJT was significantly decreased, indicating a reduction of lipofuscin accumulation by the herbal tea. Taken together, our results suggest that O. japonicus tea can extend lifespan and counteract aging process independent of dietary restriction. 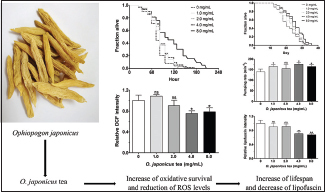 In this study, we demonstrate that OJT, the herbal tea prepared from O. japonicus tuber, is capable of not only scavenging DPPH-free radicals in vitro but also increasing the survival rate and reducing the ROS levels of C. elegans under oxidative stress induced by paraquat. We also reveal that the herbal tea can increase the activities of the antioxidant enzymes SOD and CAT and reduce the content of the lipid peroxidation product MDA in paraquat-exposed C. elegans. Further studies indicate that OJT can extend the lifespan and slightly increase the pharyngeal pumping rate of C. elegans. Interestingly, OJT is also shown to reduce the accumulation of lipofuscin, a typical age pigment. Taken together, our findings demonstrate the antioxidant and anti-aging capacities of O. japonicus tea. This work was supported by Guangdong Province Department of Education (Grant 2015KGJHZ022) and the Special Funds of the Central Finance to Support the Development of Local Universities and Colleges. Chen MH, Chen XJ, Wang M, Lin LG, Wang YT. Ophiopogon japonicus – A phytochemical, ethnomedicinal and pharmacological review. J Ethnopharmacol 2016;181:193-213. Yan X, Ye T, Hu X, Zhao P, Wang X. 58-F, a flavanone from Ophiopogon japonicus, prevents hepatocyte death by decreasing lysosomal membrane permeability. Sci Rep 2016;6:27875. Fan Y, Ma X, Ma L, Zhang J, Zhang W, Song X, et al. Antioxidative and immunological activities of Ophiopogon polysaccharide liposome from the root of Ophiopogon japonicus. Carbohydr Polym 2016;135:110-20. Zhang GQ, Wang H, Liu WT, Dong H, Fong WF, Tang LM, et al. Long-term treatment with a Chinese herbal formula, sheng-Mai-San, improves cardiac contractile function in aged rats: The role of Ca(2+) homeostasis. Rejuvenation Res 2008;11:991-1000. Xian S, Yang Z, Lee J, Jiang Z, Ye X, Luo L, et al. Arandomized, double-blind, multicenter, placebo-controlled clinical study on the efficacy and safety of Shenmai injection in patients with chronic heart failure. J Ethnopharmacol 2016;186:136-42. Kou J, Tian Y, Tang Y, Yan J, Yu B. Antithrombotic activities of aqueous extract from radix Ophiopogon japonicus and its two constituents. Biol Pharm Bull 2006;29:1267-70. Zhao JW, Chen DS, Deng CS, Wang Q, Zhu W, Lin L. Evaluation of anti-inflammatory activity of compounds isolated from the rhizome of Ophiopogon japonicas. BMC Complement Altern Med 2017;17:7. Xiong SL, Li A, Huang N, Lu F, Hou D. Antioxidant and immunoregulatory activity of different polysaccharide fractions from tuber of Ophiopogon japonicus. Carbohydr Polym 2011;86:1273-80. Sun K, Cao S, Pei L, Matsuura A, Xiang L, Qi J. A steroidal Saponin from Ophiopogon japonicus extends the lifespan of yeast via the pathway involved in SOD and UTH1. Int J Mol Sci 2013;14:4461-75. Rodrigues MJ, Neves V, Martins A, Rauter AP, Neng NR, Nogueira JM, et al. In vitro antioxidant and anti-inflammatory properties of Limonium algarvense flowers' infusions and decoctions: A comparison with green tea (Camellia sinensis). Food Chem 2016;200:322-9. Ruan Q, Qiao Y, Zhao Y, Xu Y, Wang M, Duan J, et al. Beneficial effects of glycyrrhizae radix extract in preventing oxidative damage and extending the lifespan of Caenorhabditis elegans. J Ethnopharmacol 2016;177:101-10. Chen J, Zhang J, Xiang Y, Xiang L, Liu Y, He X, et al. Extracts of Tsai Tai (Brassica chinensis): Enhanced antioxidant activity and anti-aging effects both in vitro and in Caenorhabditis elegans. Food Funct 2016;7:943-52. Zhang J, Shi R, Li H, Xiang Y, Xiao L, Hu M, et al. Antioxidant and neuroprotective effects of Dictyophora indusiata polysaccharide in Caenorhabditis elegans. J Ethnopharmacol 2016;192:413-22. Wang Q, Huang Y, Qin C, Liang M, Mao X, Li S, et al. Bioactive peptides from Angelica sinensis protein hydrolyzate delay senescence in Caenorhabditis elegans through antioxidant activities. Oxid Med Cell Longev 2016;2016:8956981. Schulz TJ, Zarse K, Voigt A, Urban N, Birringer M, Ristow M. Glucose restriction extends Caenorhabditis elegans life span by inducing mitochondrial respiration and increasing oxidative stress. Cell Metab 2007;6:280-93. Lee J, Kwon G, Lim YH. Elucidating the mechanism of Weissella-dependent lifespan extension in Caenorhabditis elegans. Sci Rep 2015;5:17128. Halliwell B. The wanderings of a free radical. Free Radic Biol Med 2009;46:531-42. Balaban RS, Nemoto S, Finkel T. Mitochondria, oxidants, and aging. Cell 2005;120:483-95. Becker EM, Nissen LR, Skibsted LH. Antioxidant evaluation protocols: Food quality or health effects. Eur Food Res Technol 2004;219:561-71. Niki E. Assessment of antioxidant capacity in vitro and in vivo. Free Radic Biol Med 2010;49:503-15. Corcuera LA, Amézqueta S, Arbillaga L, Vettorazzi A, Touriño S, Torres JL, et al. A polyphenol-enriched cocoa extract reduces free radicals produced by mycotoxins. Food Chem Toxicol 2012;50:989-95. Finkel T, Holbrook NJ. Oxidants, oxidative stress and the biology of ageing. Nature 2000;408:239-47. Rattan SI. Theories of biological aging: Genes, proteins, and free radicals. Free Radic Res 2006;40:1230-8. Kasote DM, Katyare SS, Hegde MV, Bae H. Significance of antioxidant potential of plants and its relevance to therapeutic applications. Int J Biol Sci 2015;11:982-91. Conti V, Izzo V, Corbi G, Russomanno G, Manzo V, De Lise F, et al. Antioxidant supplementation in the treatment of aging-associated diseases. Front Pharmacol 2016;7:24. Lithgow GJ, Walker GA. Stress resistance as a determinate of C. Elegans lifespan. Mech Ageing Dev 2002;123:765-71. Wang Q, Yang F, Guo W, Zhang J, Xiao L, Li H, et al. Caenorhabditis elegans in Chinese medicinal studies: Making the case for aging and neurodegeneration. Rejuvenation Res 2014;17:205-8. Huang C, Xiong C, Kornfeld K. Measurements of age-related changes of physiological processes that predict lifespan of Caenorhabditis elegans. Proc Natl Acad Sci U S A 2004;101:8084-9. Gerstbrein B, Stamatas G, Kollias N, Driscoll M. In vivo spectrofluorimetry reveals endogenous biomarkers that report healthspan and dietary restriction in Caenorhabditis elegans. Aging Cell 2005;4:127-37. Brown MK, Evans JL, Luo Y. Beneficial effects of natural antioxidants EGCG and alpha-lipoic acid on life span and age-dependent behavioral declines in Caenorhabditis elegans. Pharmacol Biochem Behav 2006;85:620-8. Terman A, Brunk UT. Lipofuscin. Int J Biochem Cell Biol 2004;36:1400-4. Cheng SC, Li WH, Shi YC, Yen PL, Lin HY, Liao VH, et al. Antioxidant activity and delayed aging effects of hot water extract from Chamaecyparis obtusa var. formosana leaves. J Agric Food Chem 2014;62:4159-65. Rathor L, Akhoon BA, Pandey S, Srivastava S, Pandey R. Folic acid supplementation at lower doses increases oxidative stress resistance and longevity in Caenorhabditis elegans. Age (Dordr) 2015;37:113.